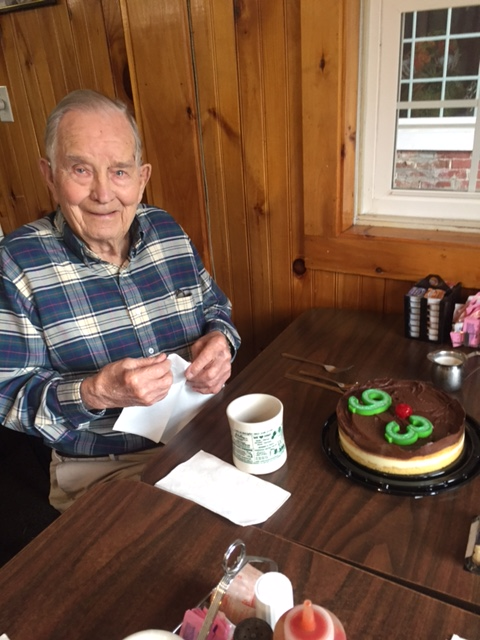 Bill Jarvi marks his 93rd birthday! Well, a change in the weather this Monday morning! No complaints though, it has been delightfully mild and many of the trees are still lovely. I see where a tropical storm has caused destruction in Ireland and the CA fires are still an issue, but here in Plymouth, we have been blessed with an extended warm spell for the numerous autumn activities. Sorry to say that I missed Bill Jarvi’s birthday, which was 10/11. He is still looking quite dapper these days! You can still send him a card at 57 Heritage Hill Pl, Rutland, VT 05701. I don’t have many birthdays on my list, so feel free to send me yours. The Reach Out Luncheon (a partnership meal of Tyson Ladies Aid and Tyson Church) will take place 10/19 in the Community Room at the church. We usually start to gather about 11:15 AM and this month feel free to wear an interesting hat as a pre-Halloween treat. A story will be shared and there will be a special guest from the Ludlow ambulance service. This cheerful gathering takes place every month to provide a social time for anyone and everyone in the community. Come meet some new folks as you enjoy this month’s menu of grilled ham and cheese sandwiches, soup, salad and dessert are provided at no charge. You might enjoy it so much that you will want to volunteer to help! The quarterly Plymouth Historical Society meeting will take place 10/26 at 7:00 PM. Their mission to preserve and to savor the history of our town is an important one, so consider becoming part of this group. All are welcome. Please be aware that our eating establishments are taking a well-deserved break but will be open and ready to serve us again next month, so call for reservations. The Inn at Water’s Edge (228-8143) will be offering a 4-course thanksgiving dinner for $25 with Tina’s grandmother’s special stuffing. The bar opens a 3:00 PM and the meal will be served at 4:00. The Echo Lake Inn (228-8602) will be offering three Thanksgiving Day servings at 3:00, 5;00 and 7:00 PM, serving crab, roast beef and turkey for $39 and $20 for children under 13. The Five Corners Pub will be open weekends until the end of Oct then take a break, reopening around Thanksgiving. The Book Club has decided on a lighter selection this time – The Last Bus to Wisdom by Ivan Doig. We will meet to discuss it on 11/16, so grab a copy and join us! We are having our Annual Tyson Church meeting at the beginning of November. We are very grateful for the response to our Let’s Rise Above the Waters campaign to help recent hurricane victims – over $2300 will be sent out this week to the UCC Emergency US fund. Although we are a tiny congregation, our mission is to follow Jesus by spreading His love through serving the community. We have provided for various local needs, including sending 4 youngsters to Bethany Birches Camp. We would like to know what other ways we can be of help to others. So, please get in touch with me and I will pass along your suggestions. This entry was posted in Community News and tagged book group, Echo Lake Inn, Five Corners Pub and Brewhouse, Inn at Water's Edge, Plymouth Historical Society, Reach Out Luncheon. Bookmark the permalink.